When were you most proud? – Dave and Lou Davit mentioned personal and team accomplishments in their careers at Johnson Controls as a source of pride, the ability to get things done. That feeling of pride continues with the achievements of current employees. What do you value most? – Responses here were varied. Lasting friendships developed over careers were mentioned as was access to resources to prepare for a rewarding retirement. That’s it so far, ‘continued connection’, ‘accomplishment’, ‘personal relationships’, and ‘resources’. A good start, I think, but we would like to hear from more members to help us set a direction forward for the WSJ Society. What do you think? Please send your response. Use the Help link on WSJSociety.com, or email jra4128@gmail.com, or give me a call at (414) 351-1229. 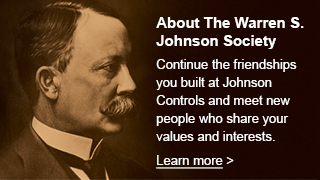 Also, check WSJSociety.com for updates on our progress.